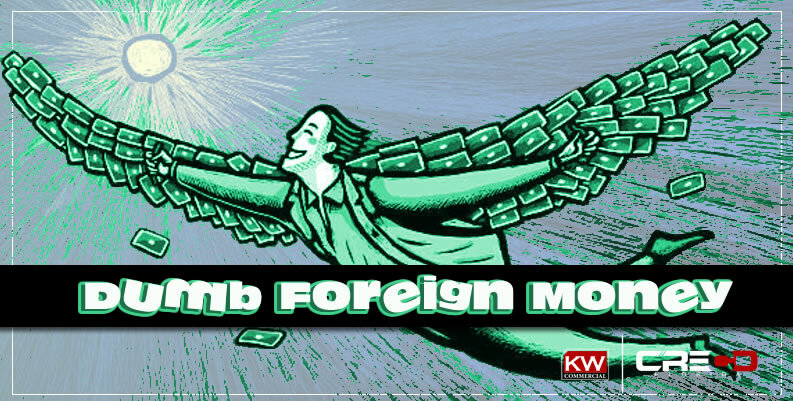 As real estate professionals, we are often presented with offers from foreign investors accompanied with a broker pitching the term "dumb foreign money." Explanations of South American or Middle Eastern windfalls of cash accompany a notion that the buyer will pay at or above the asking price just to participate in what we perceive to be an advantageous US market. However, it may just be that the "dumb foreign money" is a little bit more intelligent in seeking out returns in alternative markets. When a country has a booming and overly competitive real estate market, palatable returns are no longer feasible in the domestic markets. Because this scenario squeezes local market returns down to levels no longer attractive to investors, higher international return on investments become more and more appealing to investors. Often foreign economies will see this influx of foreign capital as "dumb foreign money" because the returns provided to the incoming foreign investors are not financially justifiable for investors within the international economy. The disparity in returns, primarily when varied by appropriate risk coefficients, creates the perception that many foreigners overpay for real estate. In reality, this perception of overpayment is directly correlated to a disparity of risk assessment by local vs. foreign investors. Locals are more in touch with microeconomic risk factors while foreign investors more often focus on macroeconomic investment risks. For example, a local investor in Italy may weigh variations in regional growth compared to other sections of Italy while a foreign investor assesses the economy and risks associated with the entire country. Concerning deal flow, a buyer willing to pay above the prevailing market value for a property will, over time, see an increased level of opportunities. High premiums entice sellers and respective brokers to the market and deals flow will be guided accordingly. There is little evidence to support the notion that a known "under payer" will be continuously presented with investment opportunities unless he or she specializes in irregular types of real estate investments that are unlikely to appeal to global investors. Although increased deal flow may seem opportunistic to many real estate investors, there is a multitude of caveats that must be understood before engaging in foreign real estate investment. A novice foreign investor will unlikely be able to compete with an established real estate mogul situated locally to the property. To properly compete with foreign investors and investment firms, entrance into a global real estate fund or co-mingled private capital fund may serve as the best way to understand international real estate investment. Any investor considering placing money into a foreign economy should examine how foreigners are perceived within the US markets. Often, foreigners come into the US real estate market and are not taken too seriously, particularly regarding granular levels of property inspection and management. If a broker brings an offer to a Seller that is well above market price, this is often easily explained away by a reference to the Buyer’s international status. "Oh, they are just rich and looking to park money in the US." Are they taken seriously? Who knows, but their money sure is. Ready to get the process started? Enter your info to sign-up to receive pre-listing notifications and other communications from KW Creco.